We believe that students’ success in college and beyond is determined by a number of factors. Students’ success in and beyond college starts long before high school ends. That’s why we don’t just help students enroll in college; we also support them throughout high school and equip them with the tools to help them thrive and persist. We’re proud to offer a wide range of direct programming for students, from individual advising to ACT prep, financial aid support, college tours, career days, and topic-specific workshops, as well as professional development initiatives for college counselors and educators. 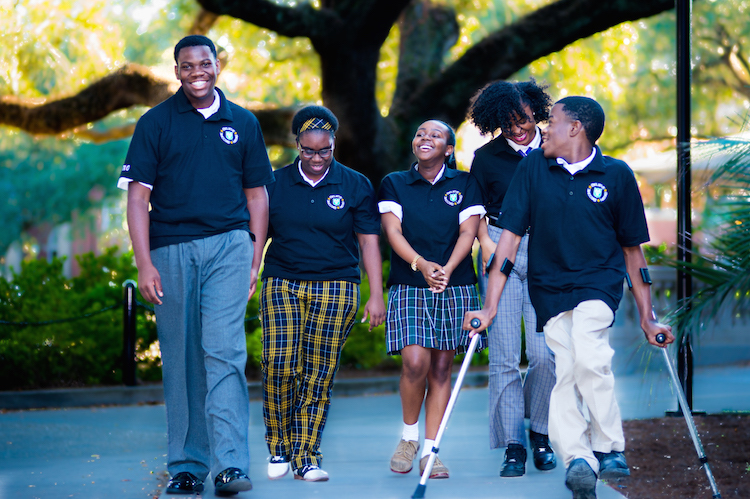 Many of New Orleans’ public school students face enormous academic and personal barriers to completing high school and transitioning to college life. At the center of our college & career programming, Upward Bound helps local students overcome many of these challenges, stay connected through college, and find post-secondary success. We currently work with 50 9th-12th graders annually and recently received an award to double in size starting in 2018. Believing that more contact means greater impact, we offer these students weekly tutoring, individual counseling, and supplemental academic support in addition to rigorous coursework and standardized test preparation. We maintain close communication with alumni, who also have the opportunity to mentor the program’s underclassmen. Ultimately, our students and team spend 8 to 10 years with each other, working toward post-secondary success. Our College Success Intern and College Advising Corps initiatives train Tulane students to assist with counseling and mentorship at the Upward Bound Program and New Orleans area high schools. During the 2016-17 school year, we engaged over 100 Tulane undergraduates through these initiatives. The Cowen Institute is a founding member and the convener for the Louisiana College Access Coalition. In response to budgetary cuts and eligibility changes to the Taylor Opportunity Program for Students (TOPS), we helped lead a group of organizations to come together in June 2016 to form the Louisiana College Access Coalition (LCAC). Our mission is to ensure Louisiana high school graduates, especially first-generation college students and those who are from low-income households, have equitable access to affordable higher education in their home state. The Cowen Institute testified in support of legislation to make TOPS more viable at the 2017 legislative session, and has helped host multiple events to raise awareness about the need for financial support for low-income students to access higher education. You can read more about the LCAC here. We focus on college access and persistence — students’ ability to successfully complete their education—by offering professional development to a vast community of counselors, practitioners, and mentors. College and Career Counseling Collaborative: The Cowen Institute engages and convenes counselors and practitioners from high schools and community-based organizations across New Orleans. The Collaborative provides members with high quality professional development, as well as the opportunity to share best practices and engage in collective problem solving centered on improving college and career success for New Orleans youth. College Counseling Training: Across high schools in New Orleans, the vast majority of counselors do not have counseling degrees or certificates and many are new to the profession. Coupled with the incredible needs of New Orleans youth related to college admission, enrollment, and completion, there is an urgent gap in our city that we together can fill. A partnership between College Beyond and the Cowen Institute leverages both organizations’ strengths in order to provide high quality, relevant training to counselors to best support students in getting into and completing college. College Persistence Collaborative: We engage practitioners to rigorously track students after high school and provide them with the level of support they need to succeed in college.